The soft portions of the animal body, internally connected with the skeleton of bones and externally enclosed by the skin (Gen. ii. 21; Job x. 11). Flesh is an article of food (Dan. vii. 5), generally roasted over the fire or boiled (I Sam. ii. 13, 15). The word is also applied to the flesh of birds (Num. xi. 33). Otherwise, the Hebrew has, usually the word (Ex. xxi. 10; Ps. lxxviii. 20, 27). In a graphic description of the oppressive tactics of the powerful, Micah charges them with eating the flesh ( ) of the people, preparing it "as flesh [ ] for the caldron" (Micah iii. 2-3, Hebr.). 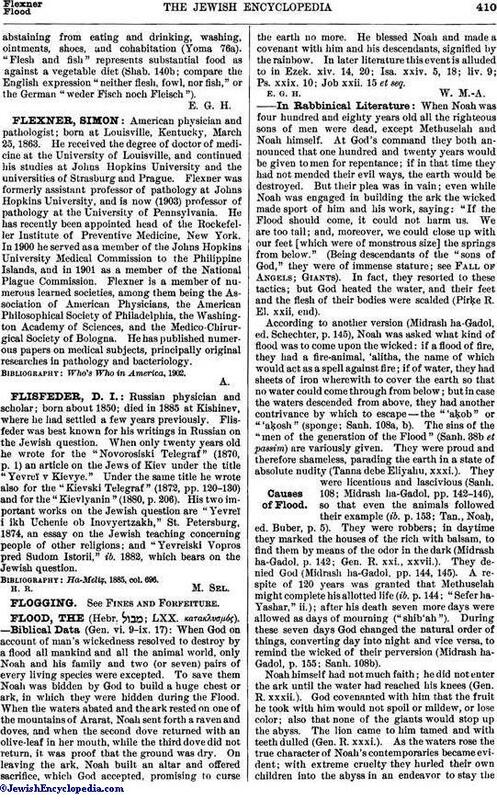 Eating of flesh with the blood in it was associated with a riotous, gluttonous disposition (Prov. xxiii. 20). A familiar but terrible menace is that one's flesh shall be given over to the birds to eat (Gen. xl. 19; I Sam. xvii. 44; Ezek. xxxii. 5). In an enlarged sense, "flesh" assumes the meaning of "body" (Ex. iv. 7; Lev. xiv. 9, xix. 28; II Kings vi. 30; Zech. xiv. 12) or of parts of it (Lev. vi. 10; Ezek. xliv.7). Employed figuratively, "flesh," soft and impressionable, is contrasted with "stone," hard and unyielding ("stony heart" as against "heart of flesh": Ezek. xxxvi. 26). As the corruptible and weak part of the body, "flesh" expresses weakness, as against "spirit," which indicates strength (Isa. xxxi. 3); in Job vi. 12 it is similarly contrasted with "brass." Thence also its use as designating "man" (Jer. xvii. 5; Ps. lxxviii. 39), especially in the phrase "all flesh" for "all mankind" (Gen. vi. 12-13 [A. V. "every living thing"], vi. 19, vii. 21; Num. xvi. 22; Job xxxiv. 15; Ps. lxv. 2, cxxxvi. 25; "All flesh is grass," Isa. xl. 6; "the God of all flesh," Jer. xxxii. 27). "Flesh," therefore, denotes also a person; "my flesh"= "I" (Ps. xvi. 9, lxiii. 2); one's whole being is expressed by "my heart and my flesh" (Ps. lxxxiv. 3). 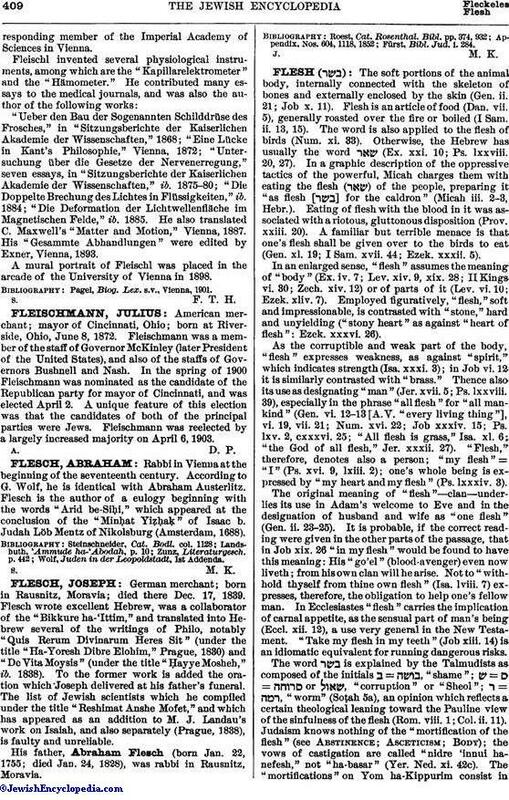 The original meaning of "flesh"—clan—underlies its use in Adam's welcome to Eve and in the designation of husband and wife as "one flesh" (Gen. ii. 23-25). It is probable, if the correct reading were given in the other parts of the passage, that in Job xix. 26 "in my flesh" would be found to have this meaning: His "go'el" (blood-avenger) even now liveth; from his own clan will he arise. Not to "withhold thyself from thine own flesh" (Isa. lviii. 7) expresses, therefore, the obligation to help one's fellow man. In Ecclesiastes "flesh" carries the implication of carnal appetite, as the sensual part of man's being (Eccl. xii. 12), a use very general in the New Testament. "Take my flesh in my teeth" (Job xiii. 14) is an idiomatic equivalent for running dangerous risks. The word is explained by the Talmudists as composed of the initials ב = "shame"; ש=ם = or , "corruption" or "Sheol"; ד= , "worm" (Sotṭah 5a), an opinion which reflects a certain theological leaning toward the Pauline view of the sinfulness of the flesh (Rom. viii. 1; Col. ii. 11). Judaism knows nothing of the "mortification of the flesh" (see Abstinence; Asceticism; Body); the vows of castigation are called "nidre 'innui hanefesh," not "ha-basar" (Yer. Ned. xi. 42c). The "mortifications" on Yom ha-Kippurim consist inabstaining from eating and drinking, washing, ointments, shoes, and cohabitation (Yoma 76a). "Flesh and fish" represents substantial food as against a vegetable diet (Shab. 140b; compare the English expression "neither flesh, fowl, nor fish," or the German "weder Fisch noch Fleisch").